Essentially a Playset is a campaign; it’s the main meat of a game that, until now, would be a separately released product on a disc. A lot. The game itself for your chosen platform and the Infinity Base (the docking station for the toys). You’ll also get three Playsets for Monster’s University, Pirates of the Caribbean and The Incredibles, so three games in one essentially. 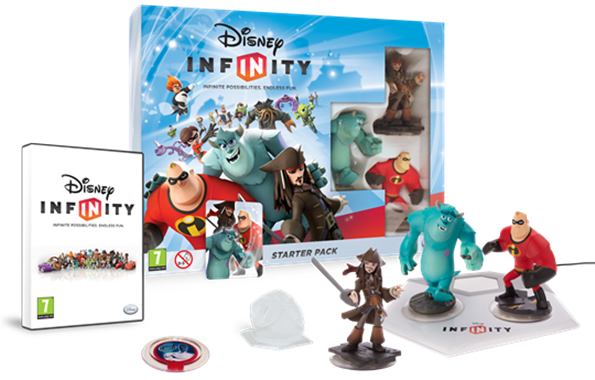 To play in these worlds you also get one character for each film in the form of Sulley, Jack Sparrow and Mr. Incredible. You’ll also get your first power disc -more on those later- and some codes to unlock online web content. Ok, so a few points to address there. You’ll rarely pay £40 for any game today, especially if you look for a deal. I think for a children’s tie-in game, £30 is closer to the mark. So far, I’ve seen pre-orders for the starter pack at £53-£60 and additional Playsets for Cars and The Lone Ranger at £29-£35. These extra sets come with two different figures from the same film. Extra characters that are sold separately are also surprisingly expensive at £11-£15 each or slightly discounted when bought in a triple pack. In an age of DLC it seems like a big ask for to buy a toy just to stick on a docking station for it to appear in a video game. Don’t expect to see as many Disney-related video-game tie-ins in the future. Chances are they’ll be getting their own Playset for Disney Infinity instead. If the prices can come down a little after the game’s initial launch period this could provide an overall cheaper alternative to parents who regularly buy these games for their kids. This is a bit cheeky really and could cause disappointment at Christmas for anyone just buying the starter pack. For the Playsets, you can only play with characters related to that universe, all of which are sold separately from the starter pack. So to add Mike to the game for Monsters University or Dash to The Incredibles for the second player, you’re going to have to fork out an extra £11-£15. In better news, the toys, Playsets, user-generated content (check out my hands-on report of the game’s level designer) and power discs will all work on any platform. This is great for players taking toys to friends’ houses who may not have the same console and sharing created stages across one huge library can only be a good thing. We’re a bit confused about the Playsets that are sold separately being multiplatform though. Does that mean the first two are already on the main disc or will they be patched on, along with every future release until we input a code? We imagine a multi-format code will be entered from a main menu to activate content rather than the usual XBLA/PSN codes. Discs can also give you extra vehicles in addition to palette themes. Or you may get physical booster ones for extra health, extra loot or extra damage. These packs will sell for £3.99, which when you’ve no idea what you’re getting could be a tough pill to swallow, it’s hardly comparable to the price of footy stickers. I imagine eBay will become flooded with players wishing to trade, especially with the promise of rare discs to be found in some packs too. We can’t wait to play more of Disney Infinity, but we are of course worried about the amount of money we could sink into it. I’m just grateful I don’t have any kids. Although, Disney have just announced a Toy Story Playset, so I’m going to have to get stuck in. So what about you readers? Do you fancy it? Ditching Skylanders for this? Has this caught the eyes of your children yet? as I aаm a usser of net therefore from now I am using neet forr posts, thanks to web.